I don't think a lot of players actually scrapped any of the AR team, at least, not that often (mostly thanks to the auto lock turned on by default and the collection aspect). That said, I'm not surprised if some of them scrapped the likes of M14 or G36 in hope of having more cores for 5* dummy link. And while I'm not surprised some of them just focus on 5* because of the usual mobage mentality, a lot of them play favorite and rush dummy link/power leveling for mid/low tier characters just because they like them, e.g. Kar and Suomi. The thing is that while information is readily available in CN, KR and EN, it isn't like they are proficient with these languages at all, so veterans advice and the likes are hard to come by for them unless they know actual JP players who played the CN or KR versions or can read the aforementioned language. Last edited by Klashikari; 2018-08-23 at 12:20. I doubt most players in EN are proficient in Chinese either, yet we're still far better informed, and I really doubt that there aren't at least a handful of Japanese players proficient enough in Chinese and/or English to be able to look up the available guides. I never said there aren't, but the point is that the language barrier is a pretty big deal in Japan, moreso when you have the usual issues when it comes to anything related to China and Korea. Meanwhile, I never implied the majority of the EN community can read Chinese or Korean, but there were definitely much more translation around. When GF was released in KR, there was a very sizable english community around the game, and you could get reports and guides in English before the EN release (in fact, I could find them quite easily at that time and tried the game in KR but gave up at a certain point). But in Japanese? It was beyond scarce in that regard. The game only gained traction in term of information coverage once the game actually got released in JP. But even during the period when the game was announced, you could barely find any basic guide for it. It was mostly some random dudes making niconico video about event boss like Gaia, but outside of that, it was not the norm. So the vast majority had to rely on usual websites like gamewith, that don't always have all the basic information. Well it's boss bullying time where defeating them once gets you masks that you can use in exchange for certain items and a kimono for Kalina. Funny thing. A Singaporean artist drew what his version of SAR-21 would look like for GF months ago. 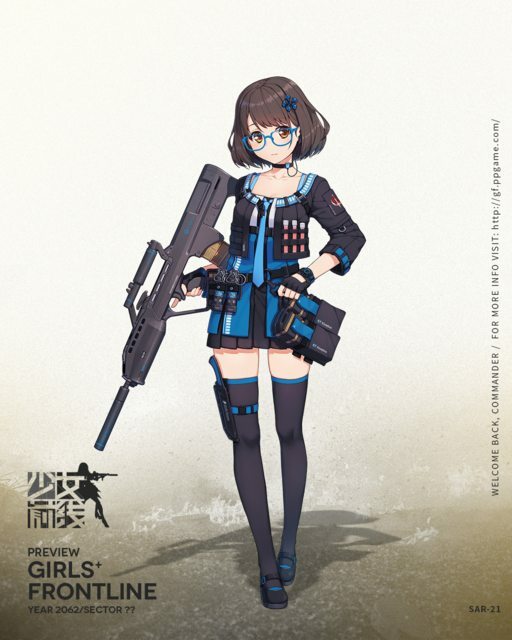 I've never seen as much enthusiasm about a new gun before in GF as there is with SAR-21, especially among the SG community. Just hope that the rest of her is as good as her preview suggests. Tomorow we are getting RO! I really looking forward teaming her up with M16! 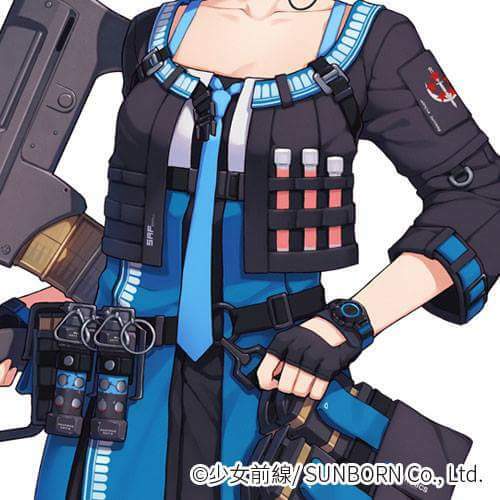 SAR-21 glasses look like they were photoshopped on the original picture for some reason. They are so out of place. Done with Cube on JP. It was much easier than I expected. I wonder how crazy it would have been if the event was similar to what CN players had, since they apparently didn't have any night battle equipment back then, so that must have been a miss festival. I'm just missing PSG but I frankly don't want to bother farming E4, simply because chasing after Ouroboros is a PITA. So the Japanese version had a PV for Operation Cube. Funny how the english version doesn't have a PV whenever a new event is coming. Also, Singaporeans are having a blast that one of their nation's guns is now in the game. Now my question how many combat data and core to make mod 3 ? 2* need 60 cores, 4* need 120 cores and you will need 9k reports, (4,5k with married doll.) regardless of rarity. I just heard RO635's lines for the first time taking her out on 0-2 runs... is she trying to be Kamen Rider W? According to people who played on CN and TW servers, not really. RO isn't that good at strategic decisions either. Of course we didn't see her full performance, but even just with chapter 7 and chapter 4N we got see enough of her character and skill to give her stamp of approval, even considering occassional mistakes given by unavoidable lack of experiences. Among them is someone who played on the CN/TW server and outlined why RO isn't actually a good commander and is only starting to get over her issues. RO actually performs kind of poorly tbh. She suffers heavily from inexperience, heavily misunderstanding her subordinates a lot (especially SOP) and mission priority (which is why AR-15 called her a failure of a command doll). These are not qualities in a military leader.